So you have made a decision to get in on the fun this Friday and shop online (albeit in China). It may be your first time, or if you are a seasoned online-shopper like myself, there are still a few pointers to take into consideration in order for you to get the best experience all round. I’m not too sure if it is 00:01AM China time, or the just after midnight locally on Friday 11 November 2016. Whichever way, be sure to have your bank account funded (or Ecocash if you so wish to pay through there, yes, you can) and ready to transact. I’d recommend that you do your shopping just after midnight on Thursday evening, so that if there are any challenges in making the payment, you still have ample time. If you try and make the payment just before midnight on Friday night, and, God forbid, something goes wrong, you’ll kick yourself knowing that it’ll be at least another 365 days before such a deal comes your way. How do I select the ‘right’ goods on AliExpress? This is somewhat subjective, in that one man’s meat is another man’s poison, but my rule of thumb here is when buying something for resale, make sure that I have a use for it should it not get bought. There’s no use getting a bunch of Note 7 covers, that if you fail to sell, you now have no use for it because you don’t have a Note 7 yourself. To get you started, search for the product that you like, making sure that FREE Shipping to Zimbabwe (or your country of choice) is selected. This way, you know that you are paying the cheapest price ever to get your goods to your doorstep (well, your nearest post office, in that you need to go collect it, but you get my point). When you get results, I always tend to go with those you have larger numbers appearing by their orders, as it shows that other buyers have trusted this seller enough to order such a quantity from this ‘shop’. Make sure you read the reviews for that seller, to be sure of what experience other buyers have had. I tend to want to ditch those that have a rating of 43.9 and below. Once you have added the goods that you like to your card and it is within budget, you will proceed to the checkout. Make sure you have your Visa or MasterCard nearby and if you refer your Ecocash account funded. Be sure to have enough both for the payment as well as the transaction charges. I can’t comment much on what banks charge, most are a fixed fee of $2 plus 1-2% of the transaction. Rather go with the upper end, they called it the “prudence concept” in school, right? So, for a $100 purchase, you will need to have in your bank account ($100 for the goods + $2 fixed fee + 2% of $100 for charges = $104). However, the safest thing to do is to find out from your bank what the charges are so that you transact knowingly. Best case scenario, have $50 extra in the account and you don’t have to run it dry. No, your card won’t be milked and emptied by some scammers through AliExpress, well, at least mine haven’t. For paying through Ecocash, you’ll need your phone nearby and buy a VCN. Instructions here. How do my goods come? (This is my assumption) The Chinese Government have enabled their national post office to carry goods for Chinese business either for free or at a subsidized cost, that will allow the cost of goods made in China to be lower, thus encouraging manufacturing there. A bit of talk of the Silk Road can be made. Anyway, all you need to know, is that after the purchase has been made, you will then get updates through your email of what is going on. I usually only got two emails, one telling me that my payment was received and another shortly there after advising my that my consignment has been shipped. For purchases less than $2, you will not be able to track, but even those over, I have failed to understand the Chinese (yes, the irony) and hence been able to follow my package around the world. What I do know, is that after about 30 days, I start checking with the guy at the post office whether anything of mine has arrived. Best way to go about this, is to visit the post office at a not so busy time and make friends with the teller behind the counter. Get his number and call or WhatsApp, it’ll save you the time and the fuel/kombi fare. If after 38 days you are yet to get a little slip in the mail box, go to your post office and get them to check with the ‘sorting office’ whether your goods have been impounded awaiting duty. In Harare, I know it to be just behind Graniteside post office, you know that one that’s at the beginning of Airport Road. I have managed to bring in quite a bit of stuff, albeit my orders would be sub-$50 (at one time ZIMRA allowed you a daily rebate of $50), so I am yet to experience the long arm of the taxman. They have since lowered the daily rebate to $10, so if your parcel exceeds this amount they will ask you to pay. China somehow got wind of this and on the slip of the description of your goods that’s attached on the outside of it, they’ve actually lowered the amount. Unfortunately, you have no direct comms with them, and this being the biggest sale of the year, there is no way that they will take direct request for anything. But anyway, we all want to pay our taxes and contribute to a higher salary for the head of ZIMRA better Zimbabwe. If your order is below $10 (yes, the goods are so cheap that you’ll get away with stuff for this little) there will just be a $2 handling fee at the post office – No, the post man does not come with your package on his bicycle and deliver it to your house. However, if there is duty for your consignment, be prepared to not only pay the duty, but to also pay a $10 handling fee to the post office. For duty, I’d say budget 40-80% of the value of the stuff you’ve bought. To avoid ZIMRA guessing a price, be sure to print your invoice, or better yet, go there with your phone that has a data connection and access to your AliExpress account and show them what you paid for the goods. What If My Goods Don’t Come? This is the interesting part, the Seller does not want a bad rating, as I’m sure the higher the rating they have on the website, the more money they make. So once you dispute that a parcel has not yet arrived, they usually refund you your money. I once had an incident, last year’s 11.11 Sale actually, when I bought something for $2.20 and it took forever to arrive. By 28 December my goods were yet to land (or so I thought) and I entered a dispute and claimed a refund. The Seller was quick to refund me my whole $2.20 and lo and behold, two days later, a slip arrives in the mail box telling me that my parcel had arrived. That was my only order that I had an incident, but note that goods can take a bit long due to this being a MASSIVE sale, and the store needing to ship thousands, if not millions of items in a short space of time. Your goods will come and if they don’t, you can always claim a refund. Should I have left out anything, please feel free to ask in the comments below and I’ll see to it that I respond to you before the big sale. How we lost $20 to EcoCash and failed to recover it up to now! I have not made use of Everbuying myself, so can’t comment. However, have seen a few friends commenting, like you have, that they have bought from there and are happy customers. – you dont need to make friends with anyone at your local post office, you can call or email people at ZImpost central sorting offices directly who can tell you where your items are after going through ZIMRA. they are actually really helpful. Yes, best is to have your username and password at hand when visiting their office. I have not gone to the step of reaching out to the guys at the ZIMRA office, my encounters have been brief and I prefer to get in there and out as quick as possible. I am in Hillside Bulawayo, my local post here no-longer send those parcel collection slips instead ,they send a sms stating (may you please come and collect your parecl at Hillside Post Office) .I am not sure about other post offices. Talk about moving with the time. I was given a phone call the one time, after I work up from the shock that they’d actually do that and I went to collect my parcel, they told me that they didn’t ordinarily to that, but on this time the post man had just left and if they had to wait for him, it would be 2 weeks before he’d visit my area again. Not too sure what the product was, but I’d say that was excessive. However, I don’t work for (and never have) ZIMRA, so I’m not too sure what their duty rates are. Did you try and dispute their calculation? Or you accepted it and paid? I prefer to get products below $10, not only because there is no duty, but in the event there is a challenge with ZIMRA, then ‘forfeiting’ it to the state is not as painful. In terms of choosing Shipping, who is the best? Some items numerous free shipping providers e.g. China Post, Swiss Post, SunYou? 1. When does the sale start? And a few handy tips, once the sale starts, servers get very congested and it will take time for orders to be processed, so the best way to beat this is to do your shopping BEFORE the sale starts. If you have an existing account with Ali express, tabobao, Tmall, or JD.com, its very wise to select the items you want to purchase and place them in your “shopping basket” before the sale. This means once the sale starts you just go to checkout and pay for the selected items. Another handy tip is that Ali express is not the only website offering sales on Singles Day. 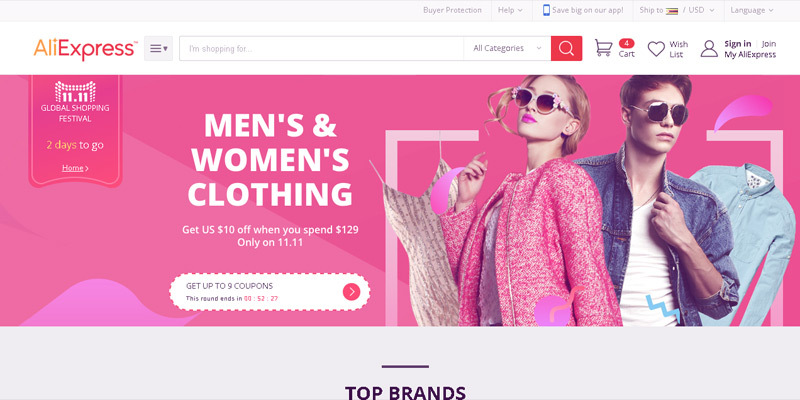 Its also very prudent to check out other sites like JD.com (which has an english version joybuy.com), Tmall.com, and taobao (the chineese version of ali express only with better products). They are in competition which is good for us consumers coz it means even lower prices.